The stay of my friend Juliane, who is visiting me for two weeks draws to an end. Thus I decided to take a holiday on Friday and explore some more unseen spots in Tokyo with her. We decided to follows the foot steps of the people who ruled Japan. We started our journey backwards through time starting from the present. 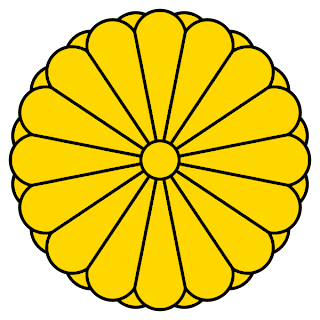 Since we lived with the current (平成 Heisei) and last Tenno (昭和 Shouwa), we started with their predecessor, the very famous 明治 Meiji Tenno who revolutionized Japan and led it into the modern age. Because of his great deeds his soul and the soul of his wife were enshrined in a huage shrine areal in 原宿 Harajuku, called after his name the 明治神宮 Meiji Shrine. Around the shrine a huge amount of wonderful trees has been planted and it is truly wonderful to walk below them, being shaded by their high coronas. 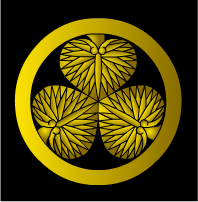 And since the shrine is dedicated to the Tenno, you can see his chrysanthemum emblem everywhere, on every 鳥居 Torii and on every gate. The shrine itself was actually not that special, but the trees around it and the paths below the trees were wonderful and dreamy. At the end of the road we also needed to activate all of our Ninja skills not to fall into the hands of a mad artist who tried to lure us into a trap, he had prepared with his paintings. Having visited the great Meiji Tenno we continued the track back through time to the family who rules over Japan for 300 years, the 徳川将軍 Tokugawa Shoguns. Six of them are buried in a temple in 港区 Minato-ku close to the Tokyo tower. We have been really lucky, because the Zoujouji temple area is surrounded with really wonderful 桜 Sakura trees. And even more with the soft wind we had that day, we could see 花吹雪 Hanafubuki Sakura leafs flowing through the air like snow. A truly wonderful sensation. Also the ground was completely covered in the wonderful white of the Sakura blossoms. Now at the temple instead of the chrysanthemum emblem we found the three leafs of the 徳川　Tokuagawa family emblem everywhere. Because of the Sakura time, there was quite some activity with sales stands, food and tea everywhere. One stand roasted fresh tea, which clothed the whole temple area in a wonderful smell. Afterwards we used the Tokyo Tower, a more modern replica of la tour d'eiffel (the Eiffel Tower in Paris, and 9 m taller) to let us catapult back into out own age. This tower also bears the byname Tokyo's biggest tourist trap. Entering alone costs 800 Yen, if you want to see the highest observatory you have to pay an additional 600 Yen and this little game is kept for every attraction of the tower until you will have paid as much as 3000 Yen. The tower looks really magnificent though, however of course from the outside! So entering the tower is actually not that special, and if you want to get a great view on Tokyo, I recommend visiting the Metropolitan Office Building in Shinjuku, which's observatory is higher and for free. However the money I saved I spent later three times when we made a brief stop in the future (Akiba), where I finally bought a Nintendo DS, Zelda the Phantom Hourglass, and the R4 Module (a little tool that lets you download roms of DS Games and play them on your DS). We also met a good friend of mine from Erlangen/Nuernberg who studied with me Japanese and Computer Science, just like this on the street ^=^.